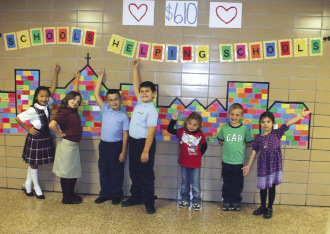 Students from St. Rose of Lima School in North Syracuse raised money for Broome County flood victims in September 2011. 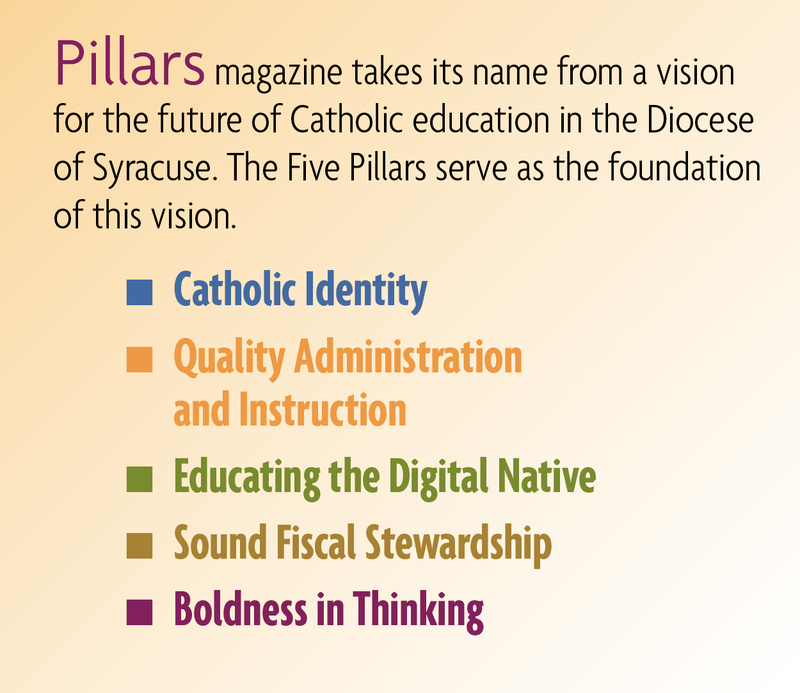 In September 2011, flood devastated parts of the Syracuse Diocese in the Southern Tier, affecting many of our Catholic school families. The students, teachers and staff at St. Rose of Lima School, N. Syracuse, put their faith into action by contributing to a fund called Schools Helping Schools established to assist flood victims in Broome County. Through donations as small as 50 cents, the school collected $610 for the Schools Helping Schools project. Each student who donated received a paper brick on a display at the front of the school to represent the rebuilding of the Southern Tier. Pictured (above) with the display, left to right, are St. Rose students Lauren Misco, Leabella McCarthy, Luke Noonan, Michael Baker, Grace Fink, Adam Bonnier and Gabriella Kazinski. Holy Cross School: The fifth grade at Holy Cross sponsored Pennies for Patients for the Leukemia and Lymphoma Society. The project combined service, core curricular areas and Gospel message, along with practical skills focusing on collaboration, problem solving and critical thinking. Blessed Sacrament School: Following up on a lesson on the tenth anniversary of 9/11, fifth graders at Blessed Sacrament School, Syracuse, collected goodies for the firefighters at Station #17 in their Eastwood neighborhood. The students walked to the station to meet the firefighters and present them with tokens of thanks for protecting them and their community. St. John the Evangelist School: Students at St. John the Evangelist organized and participated in a dress-down day to raise funds to support the Catholic Charities Flood Relief Center at St. Mary’s Center. Students and their families generously supplied needed items and cash donations. Rome Catholic School: At Thanksgiving time, first and fifth graders at Rome Catholic School coordinated a liturgy and food drive to help those in need. The fifth grade students made signs posted throughout the school as a reminder to bring in canned goods and non-perishable food items, and first graders decorated boxes for each classroom to collect donations. Boxes overflowing with food were carried up during the offertory procession. St. Mary’s School, Cortland: Students at St. Mary’s School, Cortland, were busy little elves as the Art Club made 100 hand-crafted ornaments to hang on a parish giving tree the school took responsibility for this Christmas season. Parishioners enjoyed taking the ornaments, complete with a tag describing a needed gift. Later, students in the Art Club picked up the gifts, wrapped them and delivered them to area agencies. In addition, each class at St. Mary’s put together at least one shoebox full of small gifts for a needy boy or girl close to their own ages as part of Operation Christmas Child. The boxes were distributed by Samaritans Purse, and the students were able to track their boxes via a bar code system to see their final destination.